GOMA, 13 November 2007 (IRIN) - Up to 40,000 people poured out of two camps for displaced civilians near the main town in Democratic Republic of Congo's North Kivu province after fierce fighting broke out nearby, according to the UN. "Shooting, some from heavy weapons, could be heard this [13 November] morning near the camps. Between 30,000 and 40,000 people who were living there are on the road to Goma," said Louis Igneault, spokesman for the UN's Office for the Coordination of Humanitarian Affairs (OCHA). 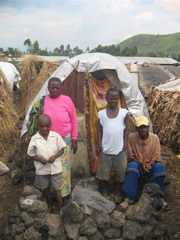 The camps, where a total of 57,000 people were housed, are located at Mugunga, 15km southwest of Goma. The road between the camps and Goma was thronged with people carrying little more than the clothes on their backs. Young children reported being separated from their parents in the confusion and many of the displaced expressed concern over where they would stay if fighting resumed. Even when the fighting subsided, "few people tried to return [to the camps]. They prefer to stay in Goma," said Igneault. He added that most of the plastic sheeting covering dwellings in the camps had disappeared, either taken by those who lived there or by looters who came into the camps after the exodus. "This morning I heard shooting and realised the rebels were coming," said Zawag Karafuru, who carried her young son on her back. "I ran from the camp." The DRC government accused dissident general Laurent Nkunda of mounting an early-morning attack on an army post near the camps but a spokesman for Nkunda denied the accusation. "They are wrong," said Bwambale Kakolele, who blamed the attack on Rwandan Hutu rebels known as the Forces Démocratiques de la Liberation du Rwanda (FDLR). The UN mission in DRC, MONUC, said government forces repelled the attack on the village of Kishangazi, mounted between five and nine in the morning. "We think it could have been insurgents close to Nkunda who attacked but we cannot rule out the FDLR," said MONUC spokesman Colonel Pierre Cherayron. On 9 November, the DRC government pledged to disarm the FDLR, by force if necessary, in a deal with Rwanda that reaffirmed several previous deals aimed at restoring peace to eastern DRC. The Mugunga exodus sparked fears of a deepening humanitarian crisis that has seen an estimated 370,000 people displaced since fighting erupted between Nkunda loyalists and the DRC army late last year. "Displaced people are getting re-displaced, fleeing for their lives," said Aya Shneerson, the head of the UN's World Food Programme in North and South Kivu provinces. "As it is, living in an IDP camp is extremely difficult," Shneerson said. "Having these people out here without proper water, without proper shelter, without proper food, is really hard for them." In January, Nkunda pulled out of arrangements to have his followers integrated into the national army, saying government forces were not doing enough to disarm the FDLR.